How do you decide on the language to use in dialogue? Clearly modern expressions would be out of place. But the language of the time is also inappropriate because readers wouldn’t understand it, even if you researched it enough to be able to write it. As with all these dilemmas, you have to find the right balance between these two approaches. There’s a lot to keep in mind. Balance, that’s the key, isn’t it? A huge help to me in recent years has been the online resource, The Dictionary of American Slang. It shows slang expressions by the decade in which they originated, like 1660s and 1930s. I’ve been able to correct some mistakes and find substitutes after finding out certain expressions weren’t as old as I assumed, like hanging out and dork. I remember remarking on an author’s use of the expression, “Oh right,” in a novel set in the 1980s. This expression has since changed in meaning in the UK. That’s good to hear. I would be afraid that I was wasting their time. 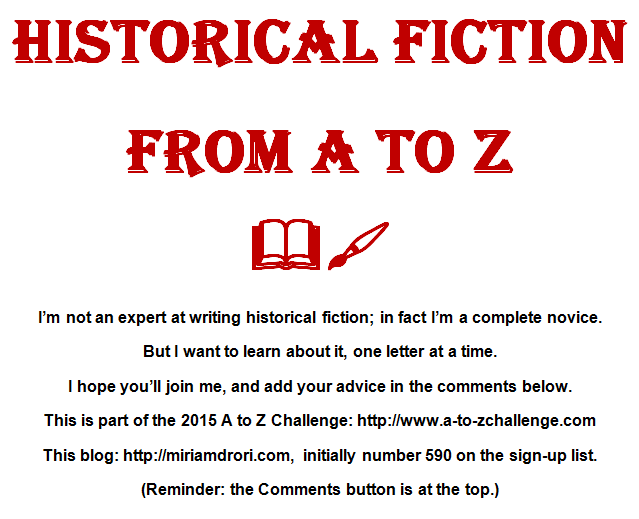 Dialogue is one of the most difficult things to get right in an historical novel. When I wrote my first, I avoided using contractions, like ‘I’m’ and ‘you’ll’, but it sounded horribly stilted and was hard work to read. So I went through the whole thing and changed it into more modern-sounding language. Some historical fiction authors go to huge lengths to research how people spoke. That’s okay if it’s relatively modern; but, as I said in a previous comment, it’s no good writing dialogue in Chaucerian English.